Let’s go for a hike on the Alps. By using EasyTrails GPS we will be able to know in real time and with high precision how far, how fast and how long we hike. We are able to see where we are on the map at any moment and easily follow back the route (traced with a line) in case we get lost. Moreover, an elevation profile will give us the altitude where we have exactly been throughout our excursion. Back home, the entire hike can be transferred (exported) on our computer. Why? To take the same path next time, to share it with our friends, to upload it on a several website, to plan our personal trainings or simply to analyze our progression. This guide will teach us how to export tracks captured with EasyTrails GPS and how to analyze them on your own computer. 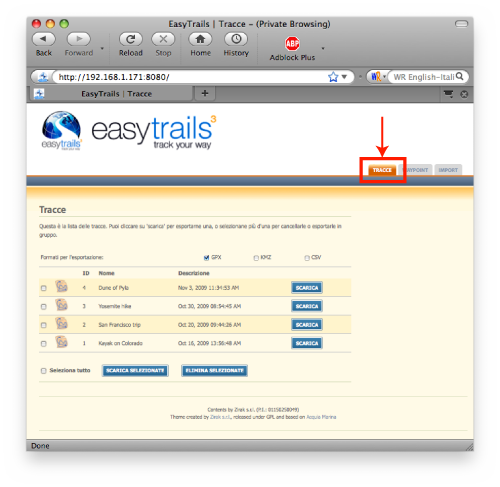 EasyTrails GPS is extremely simple to use. The export procedure is based on an innovative sharing system with no competitors on the iPhone application market. Activation is immediate: go on the sharing page (1) and push on the big green “share” button. In the top-right of the page you can see three tabs, devoted respectively to the exportation of tracks, exportation of waypoints and importation of tracks and waypoints. In this tutorial we look at the first, highlighted with a red border. 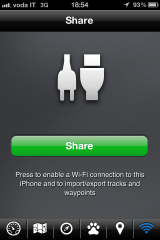 We explain how to import tracks in another article. GPX (GPS Exchange Format): this is the most complete and supported format; we recommend using it unless your specific needs require a different choice. 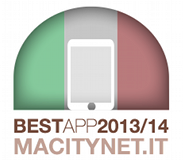 It is a text file codified using the XML syntax and it is the only kind of file that can be reimported back into EasyTrails GPS. 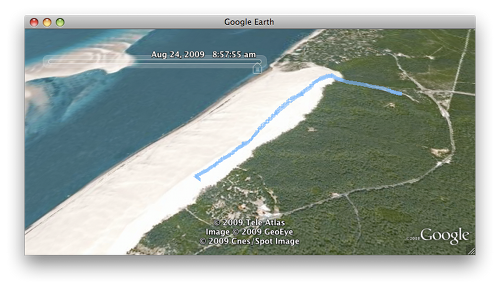 KMZ: is the format employed by Google Earth and Google Maps. It is a container of KML (Keyhole Markup Language) files. KML files are XML files but, unlike GPX, they are purely graphic because they have informations such as: “trace a blue line between point A with coordinates (x, y) and point B with coordinates (z, k)”. It is possible to create a KMZ file from a GPX, but it is not always possible to perform the inverse operation. CSV: is a purely text format used by professionals who wish to conduct deeper analysis on the tracks employing, for example, ad hoc scripts. Let’s export our running track on the Dune of Pyla (Gascogne, France), Europe’s largest dune. 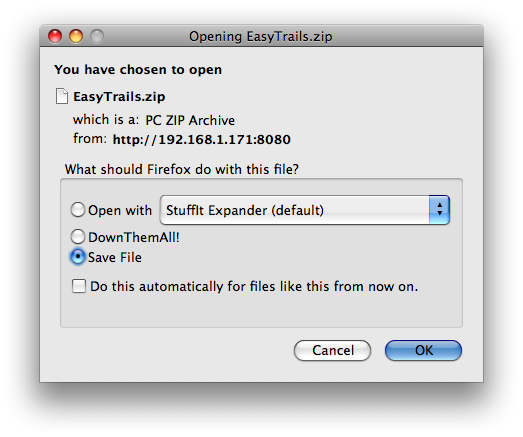 To achieve this goal, it is necessary to choose the desired formats (1) and then press the “download” button (2). The map is interactive, and you can easily zoom in and zoom out as you like. 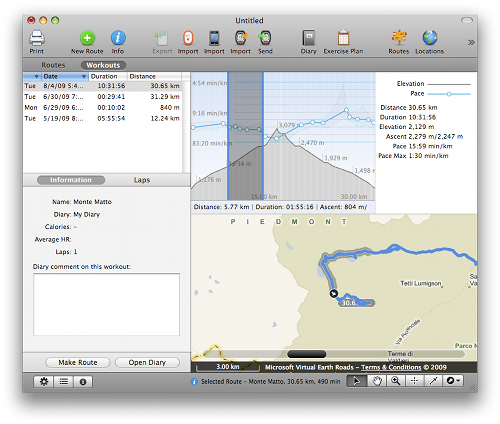 Even more interesting is the fact that you can open up the Trials with software like SportTracks (for Microsoft Windows) or TrailRunner (For Apple MacOSX). These software can calculate several statistics on the tracks, show charts, maps and much more. Moreover they allow you to monitor your physical performance, making it easier to plan and control your training in order to achieve the desired physical form. 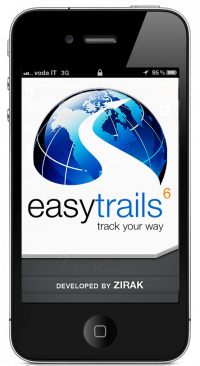 EasyTrails GPS mixed with this software is an excellent tool for athletes or simply for everyone who enjoy outdoor activities in general.